A furnished-room apartment building and the Pump shoe-salon site would be converted to an upscale restaurant and boutique hotel under a plan to be outlined for East Village Association members for a Feb. 3 vote. A proposal for 1659 W. Division from Third Coast Construction compares the project to the Ace Hotel in Portland, Ore., and Lafayette House in New York's East Village. The EVA planning committee on Jan. 12 voted unanimously to not oppose the special-use zoning that the hotel would need to proceed. The restaurant also would require an incidental liquor license. Ald. Manuel Flores (1st Ward) must approve the project. East Village residents can make their own recommendation at the Feb. 3 EVA meeting. Anyone age 16 or older who has been an EVA member for the past month may vote on the proposal. Members who do not attend but wish to vote must submit their votes in writing to a board member. Dan Sheehy of Third Coast Construction will present the plans at the 7 p.m. at the Happy Village Tavern, 1059 N. Wolcott. The developer would replace 41 single-room occupancy units with a storefront restaurant and 13 guest rooms on the two floors above. Valet parking would address traffic concerns; zoning would require only four parking spaces. Third Coast plans to use salvaged and recycled materials to earn a green-building tax credit. The Product architecture firm drafted the hotel plan with the Creative Collective marketing firm. The proposal describes the hotel rehab as "a pairing of baroque and modern." Sheehy said his restaurant partner is "well established" with "multiple venues in the Wicker Park-Bucktown area and in the West Loop," and promised to present information at the Feb. 3 meeting. A concierge will be on site from 7 a.m. to 8 p.m. daily. The proposal touts a "green hotel," stocked with locally supplied organic beauty products. "A local and sustainable designer will design the room furniture along with the bed frames, mattresses, and sofa beds," it says. The current use of the Building is an SRO (single room occupancy) with over 40 low-income apartments. 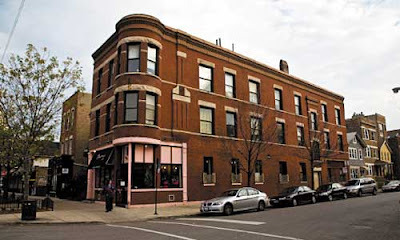 Will these low-income residents need to move away from the East Village/1st Ward? Farther away from public transportation? What is the plan? Sounds like Gentrification to me!